If you stop and think about it, it’s almost impossible to use an entire pencil because after repeated sharpening sessions you eventually end up with a tiny unusable stub. What a ripoff. There’s a solution to that problem, though. 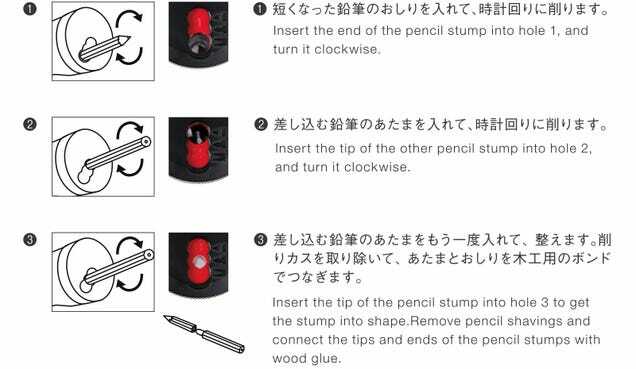 A clever new sharpener with multiple blades that lets you stack a stub onto a brand new pencil and keep using it until it’s completely gone. Japan-based Nakajima Jukyudo’s Tsunago has three different holes and blades instead of just one. The first is used to sharpen a pencil like normal, but the second bores a hole in the bottom of a short stub while the third creates a plug on the tip of a brand new pencil allowing the two to be connected with a perfectly-sized interlocking joint.